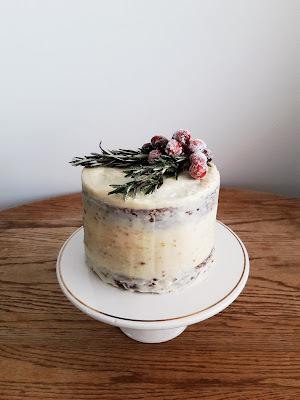 Does anyone else love to bake around the holidays? It's one of our favorite things to do together. We have already made several holiday themed treats this year, including this gingerbread layer cake. Neither of us grew up having ginger flavored anything around the holidays. It's such a big hit and we felt like we were missing out so we found this recipe and decided to try it out. While making it I offered Erik a taste and he ended up eating almost an entire cake by himself in minutes. Needless to say I had to make more to finish the cake. Line three round six inch cake pans with parchment paper, grease and flour. In a medium bowl whisk flour, baking powder, salt, ginger, cinnamon and cloves. Add sugars and mix until light and fluffy. Add eggs one at a time, incorporating completely after each addition. Add molasses and vanilla and mix until well combined. Alternate adding the flour mixture and buttermilk, beginning and ending with the flour mixture. Flour, buttermilk, flour buttermilk flour. Spread batter evenly into your pans. Smooth top with a spatula. Bake for 25 - 30 minutes or until a toothpick inserted into the middle comes out clean. To decorate I used homemade cream cheese frosting. In a large bowl, beat butter and cream cheese until fluffy. Add powdered sugar one cup at a time. Use more or less powdered sugar if needed. 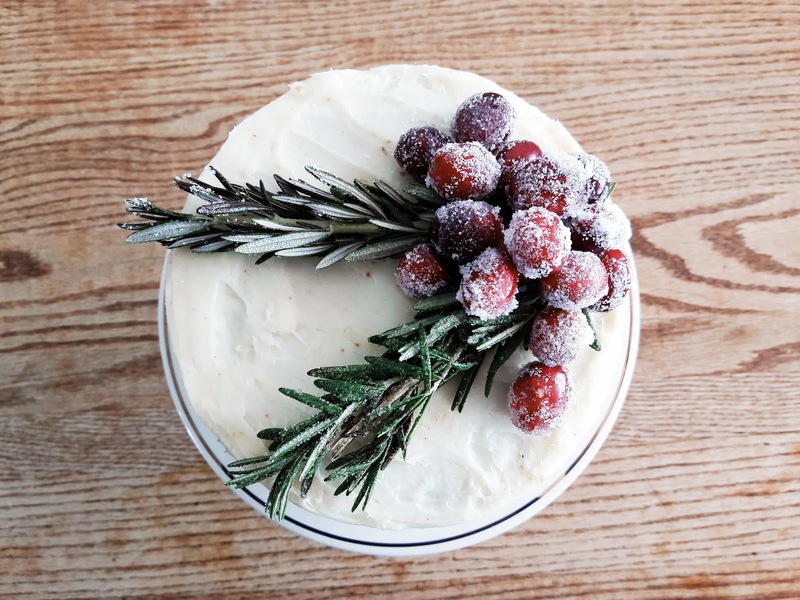 Once your cakes have cooled, place a small dot of the cream cheese frosting at the center of your serving dish. 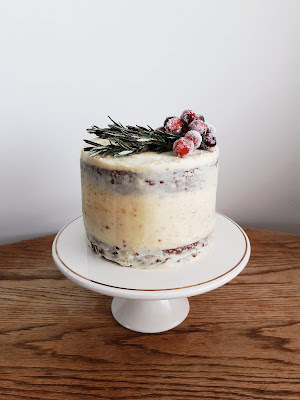 Place one cake on top of the dot, apply a thin layer of frosting to the top of the cake and smooth. Add the next cake and repeat. Add the final cake and repeat. Once you have your layers stacked add frosting around the entire cake and smooth. 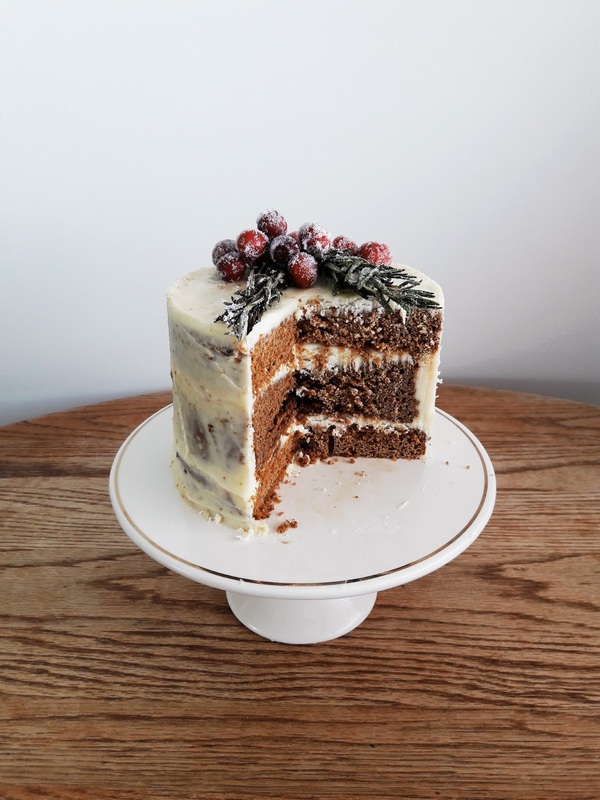 The first layer of frosting is referred to as a crumb coat, as crumbs from the cake usually stick to the first layer of frosting. I liked the look of the speckled crumb coat for the gingerbread cake. It gave it the look of a naked cake. If you would like a more finished look let your crumb coat set in the fridge for thirty minutes and then add another layer of cream cheese frosting. 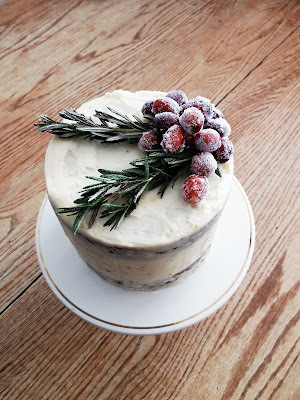 On top of my cake I added frosted sprigs of rosemary and cranberries. 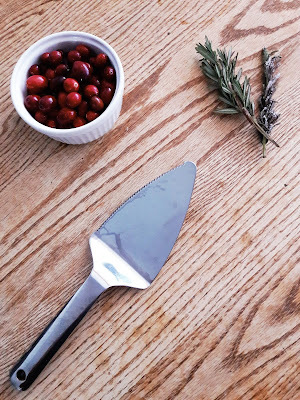 To frost, wet the rosemary and cranberries and lightly sprinkle with sugar. It's festive but took minimal effort. And as I mentioned, it's DELICIOUS! What is your favorite thing to bake around the holidays?